Hua Hin (Thailand) – January 9, 2019 (travelindex) – Best Western Hotels and Resorts has announced the signing of a stylish new seafront property in the popular resort town of Hua Hin, on Thailand’s gulf coast. 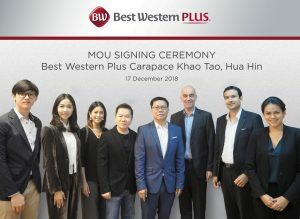 Best Western Plus Carapace Hotel Khao Tao will feature 410 guest rooms and an array of leisure amenities for all types of guest, including couples and families. Nestled close to the beach just south of Hua Hin town center and 2.5 hours’ drive from Bangkok, this contemporary resort will provide the perfect destination for locals, expats and international travelers seeking a revitalizing break from the city.